Haridwar, as befits a Holy City, is a vegetarian town - and no alcohol is available. Think of that: a dry vegetarian town! 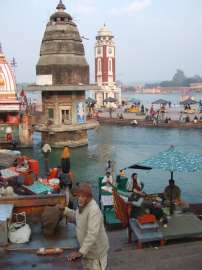 If you want to visit a Holy City from Delhi then Haridwar has to be your first choice. First of all, it is only 4½ hours away by train; secondly it is the Holiest City in Hinduism; thirdly it worth the effort. It is where the Ganges leaves the mountains and is especially blest by being one of four places where a drop of heavenly nectar fell from Heaven during the wars between Shiva and the Demons. It also has a footprint of the God in the rock: two divine interventions for the price of one. They just had to build a temple there. The Temple area is called Hare ki Paire and the holiest spot is the Brahma Kundu. Because of this it is one of the sites of the Kumbha Mela, the great Hindu Festival that is the greatest gathering of human beings on the planet. The Mela goes to each of four holy sites in rotation every 3 years so each place has it every 12 years. 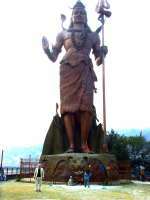 It is due in Haridwar again in 2010. So if you want to see thousands of naked saddhus walking into the river this is the place to be. Haridwar, as befits a Holy City, is a vegetarian town - and no alcohol is available. Think of that: a dry vegetarian town! If that is not enough to concentrate the mind, it also has the strictest, most austere and disciplined ashrams for the genuine seekers after enlightenment. None of the loose living, happy, clappy, westernized ashrams like you find just up the river in Rishikesh. When they say celibacy and fasting in Haridwar they mean REAL celibacy and fasting. Every evening at sundown there is a ceremony paying tribute to the Goddess Ganga in the Hare ki Paire. 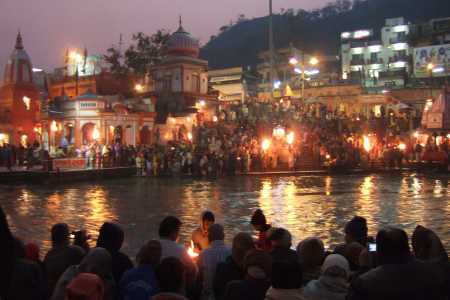 This is called an “aarti ganga” and is the culmination of the pilgrimage for many. It is a beautifully simple and very significant ritual where prayers and hymns are played over a PA system and the faithful place banana leaf boats containing flowers and candles in the river and watch them drifting off down the river towards the sea, 2,500 kilometres away. It is a lovely tranquil moment watching the bobbing candles disappear downstream. Peaceful, that is, until the Pilgrims start to do an Indian version of the Mexican wave down the banks of the river with lots of shouting and laughter. Most people are in Haridwar on pilgrimage and therefore feeling charitable so the beggar population beggars belief. The halt, the lame, the lepers, the full panoply of 15th century illnesses and conditions are all there to give you an opportunity to exercise your charity. There are many professional beggars too whose technique includes a loud irritating and aggressive demand for money continued as long as it takes to make you wish to kill them; but what you actually do is give them 10 rupees to get rid of the dreadful noise they are making. This can be a mistake. If you show weakness the crowd swells and closes in menacingly and if you try and pay a few more off you will be overwhelmed by hardy active beggars all pulling at your arms or clothing and screaming for money. Small children and beggars who have to operate from ground level even assault your legs. One of our party made this mistake and we had to leap into a series of waiting rickshaws to make our getaway. We were hotly pursued by a sham saddhu with an improbable head of hair and a nice middle distance running style. He eventually gave up and we were able to descend from our conveyances and vastly overpay the peddlers who made us feel very bad indeed by being about half our size. Following the age-old advice to travellers that when in Rome you should do as the Romans do, we decided that we should pay tribute to the Ganges by taking a bathe at the Holy Place. It is clean and fast flowing at this time of year and the famous cold temperature is nothing to a man who used to swim in the Irish Sea when it was safe to do so. Making some enquiries, we were told it was no problem; all were welcome to have a dip. This is a far cry from even the recent past when non-Hindus were not allowed into the Temple area. We bought cheap clothes to wrap around our loins and set off for the Kundu. Some pandits or Brahmin priests appeared to take us through the ceremony of doing “puja”. They were slightly disappointing as they were wearing leather jackets and sunglasses, unlike the other pandits in the area who were dressed in more traditional garb. However they said they were modern pandits and we had no reason to doubt them. A moment later and we were poised on the Ghat bracing ourselves for the immersion. Nobody took any notice of us and we were left alone with our thoughts. Because the stream is strong at times there are chains attached to the bank, which you hold to save you from being washed away. There was little danger of that happening but it was comforting to have something to hold onto as you ducked in. No hanging around and we are out again where the pandits closed in with a lot of prayers and chanting, and a very elaborate multicoloured bindi on the forehead. 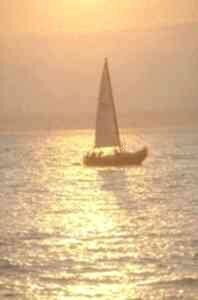 You placed a boat of leaves in the water full of flowers and all your sins drifted away down the river. You are cleansed and reborn. I am not a believer but I still felt that I had done something of human significance and was happy to have done it. The pandits collected their fee and we went on our way happily to find a cup of chai. Apart for the Temples, there is a Chair lift to a Peak above the Town to visit - well, yes - another Temple. This is where Mansu Devi holds court. She is a wish-fulfilling Goddess and is obviously very popular in the season, if the crowd control measures are anything to go by. On the day we called she was not pulling such a big crowd but there were lots of school kids making a wish before their exams. Bright and confident, they all wanted to try out their English. The boys all wanted to be doctors, engineers or pilots. The girls all wanted to marry doctors, engineers or pilots. Just as well, I suppose. The other Big Sight is the Big Statue of Shiva on the way to Rishikesh. It towers 60 or more feet high and is impressive in it’s bulk. It is so gigantic that the only way to view it is from a distance. Up close and you lose all perspective. 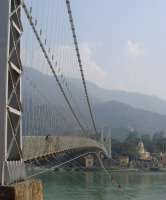 Some ten miles away is the neighbouring and much smaller Holy City of Rishikesh. This is more laid back and is beautifully placed on the banks of the Ganges just as it leaves the foothill of the Himalayas. It had its 15 minutes of fame back in the 1960s when it was discovered by the Beatles who visited their new guru in his ashram there. The Maharishi Yoga didn’t last long as his incredibly irritating giggle and insatiable need for “donations” quickly got on their nerves and they left. I often wondered at Ringo’s description of the place as “just like Butlins” but he actually got it dead right. The ashrams there are all chalets and apartments and the gardens are full of larger than life Plaster Tableaus of scenes from the Sacred Books. Very similar to Mosney in its heyday. Today, Rishikesh is a relaxed little town full of elderly ashram dwellers. Very few of the smart set are left although I did see one aging hippy walking very purposefully along. He seemed quite happy. Even the beggars are fewer and more relaxed and some sing or play music rather then just plain begging. They tend to congregate at the impressive suspension bridge for pedestrians across the Ganges. This is the only way to get across the river except for a small ferry. So the bridge is quite busy. This fact is not lost on the troops of monkeys who line it’s supports watching and waiting. As I walked across I found I was accompanied by a large male monkey who strolled along nonchalantly as if he owned the place. Further on we saw a monkey mugging a young woman who was carrying her groceries home. The monkey jumped at her and caused her to drop her bag. She screamed and the monkey grabbed a packet of biscuits out of the bag and scampered away up the bridge. Come to think of it, maybe they did own the place. The best way to travel from Delhi is by the Shatabdi Express which leaves every morning at 7.30 am and returns in the evening at about 6.30am. If you enjoyed reading the above article then you will probably also enjoy Jaipur by John Gregan, and Borneo, also in Asia, and our latest articles covering the Orinoco Delta, La Mata, Marbella and Beijing.